Charles Rupert, known as Bert, was born in 1882 the son of Henry Mason and his wife Rhoda née Rushent. He was the third child of at least eight, and also the third son after Harry Reginald (born 1877) and Frederick James (1880). His birth was followed in the ensuing years by William George (1883), Gertrude Elizabeth (1886), Edith Agnes (1889), Rhoda Ann (1891) and Walther John (1893). Sadly Rhoda Ann died in infancy, before her first birthday. Harry worked in Newbury as a coal heaver, hard physical labour, which may have contributed to his death in 1897 at the relatively early age of 49. Rhoda took in washing to earn a living, but life was not as hard for her as it might have been had Harry died a few years older because the elder sons were of working age and were able to contribute to the family budget. By 1901 two of her sons had left home, Harry to work as a coachman in Shiplake and Bert, who had enlisted into the Royal Berkshire Regiment on 6 December 1899 and would have joined the 1st Battalion at Parkhurst on the Isle of Wight. He would then have gone with the battalion to Gibraltar returning to Southampton 26 October 1902. They spent a few months in the Woking and Aldershot area and moved on to Dublin 30 August 1904. They were in Ireland until 4 October 1910 serving briefly suppressing riots in Belfast. They returned to Aldershot where they remained until the outbreak of war. Bert would have enlisted for a 12 year term, of which a part would be spent in uniform with the battalion (typically 7 years); the remainder of the term would be spent as a civilian in the Reserve. It appears that, when war broke out, he volunteered to re-enlist in his old regiment. As an experienced soldier he would not have required much training, so he was soon sent to France, where he landed on 23 November 1914. He was one of a draft of replacements for the 1st Battalion, probably the 6th reinforcement consisting of 2 officers and 149 men that joined the battalion at Caestre on 30 November. In September 1915 the British were planning an attack on the German lines near the coal mining town of Loos-en-Gohelle in northern France, part of a major Anglo-French offensive known as the Battle of Artois. This element of the larger offensive was to earn its own name as the Battle of Loos. It was the first time the British used poison gas (chlorine). The 1st Battalion were in reserve on the day of the opening advance (25 September 1915) but were called into action on 28 September. They were attached to the 7th Division which was tasked with the capture of a section of the German lines in an area known as The Quarries between Hulloch and a mine called Fosse 8. The 1st Battalion's specific rôle being to attack a strongpoint known as the La Bassée Railway Triangle Redoubt (passing through the lines captured by the first wave of the attack). Things went awry from the start and the Battalion's objective was changed to Fosse 8 itself (if everything had gone to plan this would have been captured by the first wave, before the 1st Battalion moved forward). Attacking in bright moonlight at 2.30 am, passing through trenches captured by the first wave, they moved forward, until they were spotted 400 yards short of the German positions. MASON – Private R Mason, 5734. 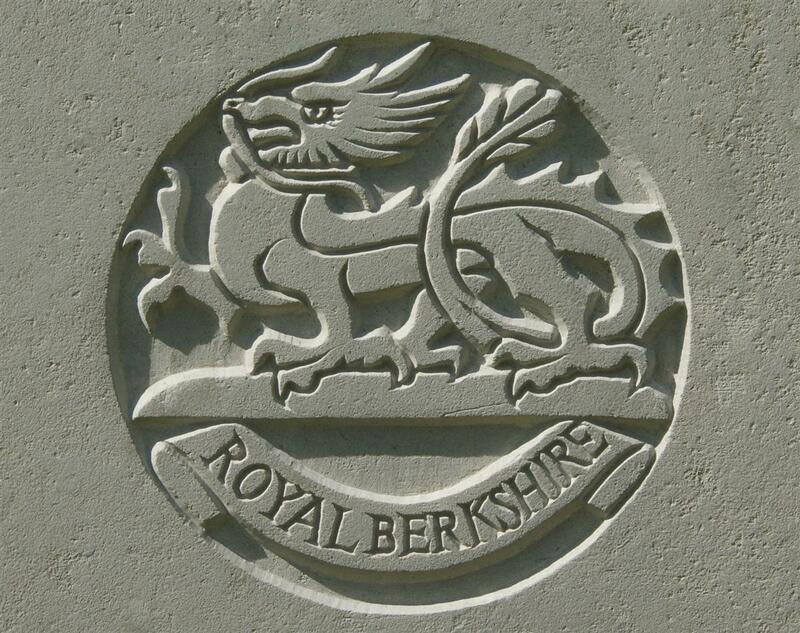 1st Royal Berks, attached 170th Co, RE, third son of Mrs Mason, South View-cottages, Northcroft-lane. Missing since Sept 28th. Also Private W G Mason, 7286 Oxford and Bucks LI, fourth son of above. Missing since May 16th – Any information would be thankfully received by their mother. A report of ‘missing’ always left some hope that the soldier was out in no-man’s land keeping his head down until he got the chance to crawl back to the British lines, or he had been captured and would resurface in a POW list a few weeks later. Sadly this was not the case for Bert (or for his brother William), but it was a year before he would be presumed dead by the War Office. MASON – Reported missing on September 25th [sic] 1915, now officially presumed dead, Charles Rupert (Bert) Mason, Pte, Royal Berks Regt, late of Upminster, Essex, third son of Rhoda and the late Henry Mason, Northcroft, Newbury aged 33 years. Bert’s body now lies in grave II.D.13 at the Arras Road Cemetery, Roclincourt but it was not buried there until September 1927. His body had been recovered from the battlefield at map reference ‘44a.G.4.d.central’ – this refers to a small area within the German lines of that date. This helps to clarify one issue arising from the newspaper notice reporting him as ‘missing’. This stated that he was ‘attached 170th Co, RE’, in full the 170th Tunnelling Company, Royal Engineers. It seems unlikely that he would meet his end in the German lines if he were working with a tunnelling company. However, prior to the launch of the Loos offensive on 25 September tunnels were driven under the German positions known as the Hohenzollern Redoubt and filled with explosives which were detonated as the attack was launched. During the ensuing infantry actions tunnellers would go forward to investigate enemy tunnelling activity and could well be killed. However, the location of Bert’s body was within the area that his battalion attacked across that day, suggesting that he was with them. As stated in the war diary the battalion’s attack was a last minute affair and men had to be collected from fatigues and working parties in order to attack FOSSE No 8 at 2.30am. Bert’s activities with the tunnellers may well have been considered a part of a working party. 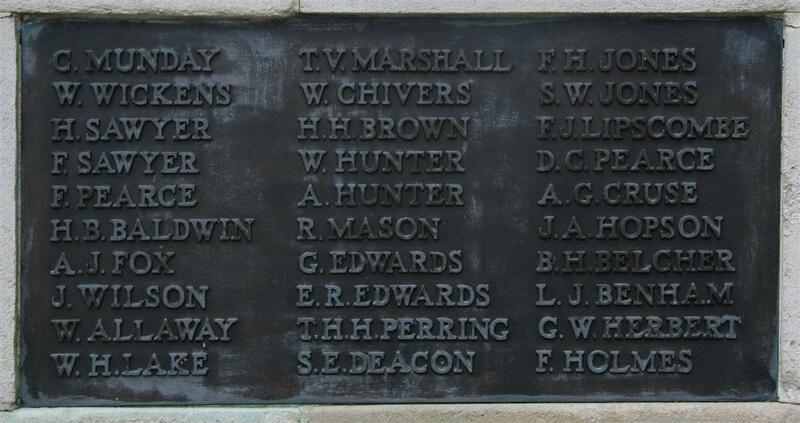 Locally Bert is remembered on tablet 1 of the Newbury Town War Memorial; unusually he is not on the same tablet as his brother Bert. The names on the memorial were placed by lot, meaning that they are randomly distributed, but exceptions to this were made in the case of brothers, who are usually listed together. George and Bert are an instance where this did not happen; presumably those determining the distribution were unaware that they were related. George (W G) Mason died serving with the Oxfordshire and Buckinghamshire Light Infantry, his story is told here.